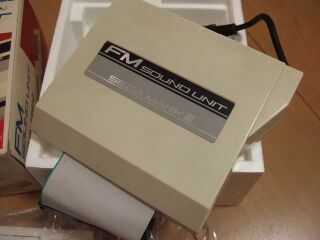 The FM Sound Unit (FMサウンドユニット) is an add-on for the Sega Mark III used to enhance the sound output of certain Mark III games. It was sold in Japan from 1987 for ¥6,800. The FM Sound Unit contains a YM2413 FM chip that acts on top of the built-in SN76489 PSG chip, adding nine extra mono sound channels. When the redesigned Sega Master System hit the Japanese market, the FM Sound Unit was built-in to the console (though it is absent from international releases). Unfortunately not all Mark III or Sega Master System games made use of this feature. The unit was not built into the Sega Mega Drive or Power Base Converter, so these extra features cannot be activated when playing Master System games on Sega's 16-bit console. Note: Only the Japanese versions of Phantasy Star and Ys: The Vanished Omens have FM Sound Unit support. Out of these, only Wonder Boy III is known to have been released in South Korea. However, the FM audio in Wonder Boy III will only function with a Japanese system equipped with FM audio capabilities; Western consoles modified with FM audio use PSG due to the game's region detection code. This can only be bypassed with a hardware modification or a hack in the game's code. Great Baseball (1985), Pit Pot and Teddy Boy Blues have control issues when the FM Sound Unit is connected, and Sega included a special notice with the add-on to let owners know of these compatibility issues.